(Macao, Dec. 6, 2018) — Around 350 volunteers from Sands China Ltd. and local community groups worked together Thursday at The Venetian® Macao to build 35,000 of the 80,000 total hygiene kits of the Las Vegas Sands 2018 Global Hygiene Kit Build with Clean the World. It is Sands China’s fifth year participating in a hygiene kit build. This year’s event is also one in a series of activities celebrating the 10th anniversary of the Sands Cares Ambassador programme – a platform for Sands China team members to volunteer in the local community. 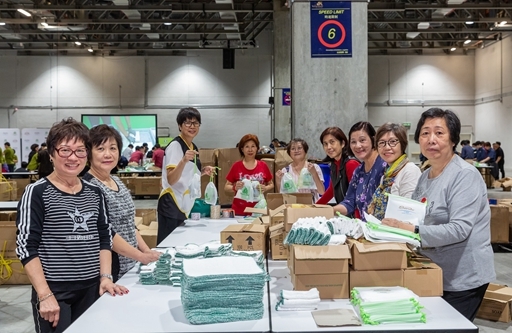 The hygiene kit build is an annual worldwide volunteer effort of Sands China’s parent company, Las Vegas Sands Corp. (LVS). The event helps international social enterprise Clean the World provide populations in need with access to hygiene supplies that are essential for good health and preventing the spread of disease. Thursday’s 35,000 assembled kits benefit global charity Children International, who will deliver the kits to families in need in the Philippines. Sands China’s volunteer event is part of a series of hygiene kit builds held between August and December 2018 at LVS properties around the world: Marina Bay Sands in Singapore; Sands Bethlehem in Pennsylvania; The Venetian in Las Vegas; and The Venetian Macao. The effort is part of LVS’ global corporate citizenship programme, Sands Cares, and its ongoing partnership with Clean the World. 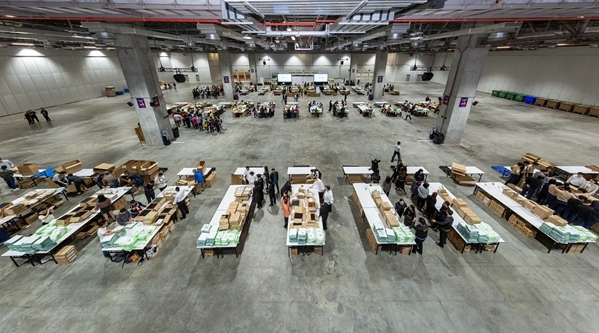 Volunteers met at The Venetian Macao Thursday to assemble the 35,000 hygiene kits – about 270 Sands China team members and Sands Cares Ambassadors, and around 80 volunteers from three local associations: Fuhong Society of Macau, The Women's General Association of Macau, and The Salvation Army Macau. The completed hygiene kits include soap collected from Clean the World’s hospitality partners, including LVS properties around the world, and recycled through Clean the World’s soap sterilization and re-manufacturing process. The kits also contain face towels donated by Linyi Standard Textile Trading Co., Ltd., dental kit sets donated by Ming Fai Enterprise International Co., Ltd., shampoo, conditioner, bath gel, and a card with an encouraging message from Sands China – all of which is placed into a non-woven bag. Thursday’s event included an anniversary cake representing five years of cooperation between Sands China and Clean the World on the global hygiene kit build. Including this year’s event, Las Vegas Sands will have created nearly 500,000 kits to date. LVS’ annual hygiene kit builds also provide critical funding support for Clean the World. For each assembled kit, LVS contributes US$1 to the Clean the World Foundation. The US$80,000 donation generated from this year’s global kit build will help drive the foundation’s mission in two key areas: ongoing hygiene education and disaster response. 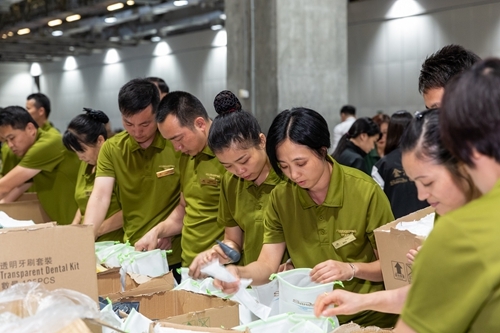 The annual Las Vegas Sands Global Hygiene Kit Build is an element of the company’s long-term partnership with Clean the World to simultaneously help people through improved hygiene access and protect the planet by diverting waste from landfills. Since 2011, LVS and Clean the World have recycled more than 300 tons of waste from LVS properties into more than 2.1 million bars of soap. In addition, LVS has donated more than US$2 million to Clean the World since 2014, which has helped the organisation double its production of recycled soap and expand service into new areas. Photo caption: Representatives from Sands China Ltd., Clean the World and three local Macao community associations participate in the Las Vegas Sands 2018 Global Hygiene Kit Build with Clean the World Thursday at The Venetian Macao. 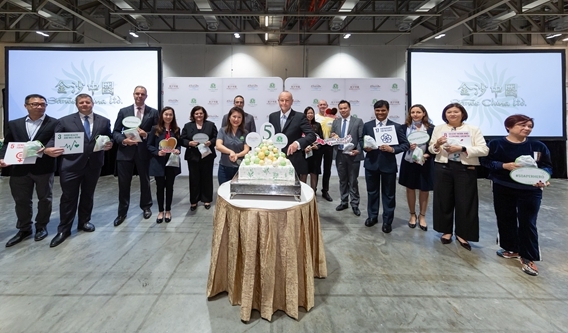 The event included an anniversary cake representing five years of cooperation between Sands China and Clean the World on the global hygiene kit build. 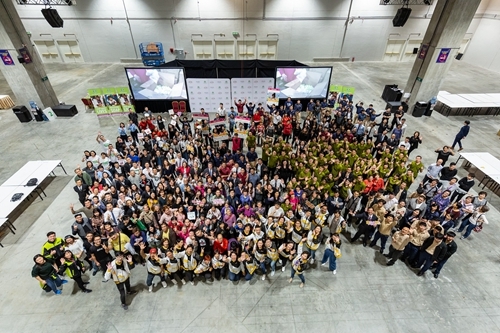 Photo caption: Around 350 Sands China team members and members of the Macao community join together Thursday at The Venetian Macao to build 35,000 hygiene kits for the Las Vegas Sands 2018 Global Hygiene Kit Build with Clean the World. Photo caption: Volunteers from Sands China and local community groups build hygiene kits at The Venetian Macao Thursday for the Las Vegas Sands 2018 Global Hygiene Kit Build with Clean the World.